The Lok Satta Party welcomes formation of new States if they are meant to serve public interest and not of the ruling party, its State President Katari Srinivasa Rao and General Secretary Ravi Maruth told a media conference here today. They made it clear that the Lok Satta is taking strong exception to the dictatorial manner in which Delhi is seeking to bifurcate Andhra Pradesh. The Lok Satta welcomes carving out of one or more States as part of a comprehensive and amicable settlement. 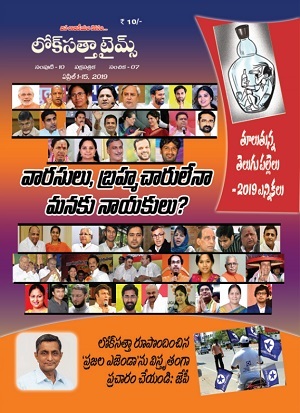 Mr. Srinivasa Rao condemned distorted reports in a section of the media about the Lok Satta stand as articulated in the AP NGOs’ all-party meeting in Hyderabad on December 21. He recalled that the Lok Satta has taken a consistent stand in the meetings convened by the Telangana JAC and the TRLD also. Mr. Srinivasa Rao underlined that the State can neither be kept united nor bifurcated forcibly since it threatens the federal set-up and democracy. The Congress has, however, taken up bifurcation process two years and a half after the Srikrishna Committee submitted its report with an eye on votes and seats in elections, and not out of love for Telangana people. The Center has sent an incomprehensive bifurcation Bill to the Assembly after fuelling animosities among people of different regions of the State. Mr. Ravi Maruth asked why the Chief Minister has not sought public opinion on formation of Telangana at Rachchabandas he has conducted. 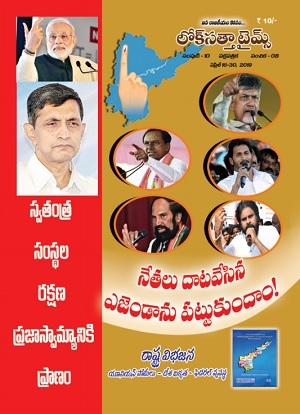 He said the Lok Satta respects the sentiments of Telangana people for a separate State. At the same time, hasty bifurcation of the State without rendering justice to backward areas in north Coastal Andhra and Rayalaseema, sorting out financial and river water problems is unwarranted. Again, going ahead with formation of a new State without obtaining the endorsement of the Legislature will lead to grave consequences. Mr. Katari Srinivasa Rao announced assistance of Rs.50000 to Dubagunta Rosamma, who is down with a serious kidney ailment. It may be recalled that the Lok Satta had lunched a movement against unbridled liquor consumption in association with Rosamma of Dubagunta in Nellore district. Party Vice President Allu Ramesh Reddy took part in the media conference.